ISBN 59 229-006-X from SAP-Press. The book is available and the German translation has been printed too. The workflow book is fat, because we decided to include technical detail for people implementing as well as overviews for readers just curious. 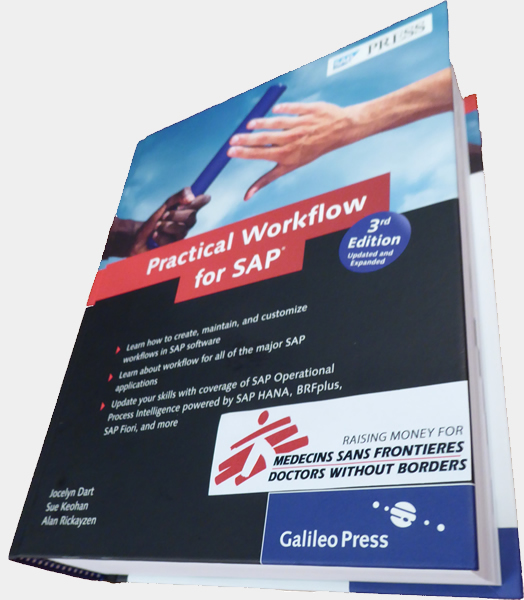 The first 200 pages or so is packed with information relevant to someone who wants deploy an SAP-provided workflow. Tons of hints, and background information. The next 200 pages are for workflow developers. And then there are sections showing examples of how WebFlow is used mySAP components (mySAP CRM, mySAP EBP, R/3). Checklists and other useful stuff round off the book. Does the book supplant the online documentation? No, even though the book is extensive we did not have the space to cover all the detail. Depending on what you want to do (particularly in development) you will need to refer back to the online documentation for Release-specific detail. 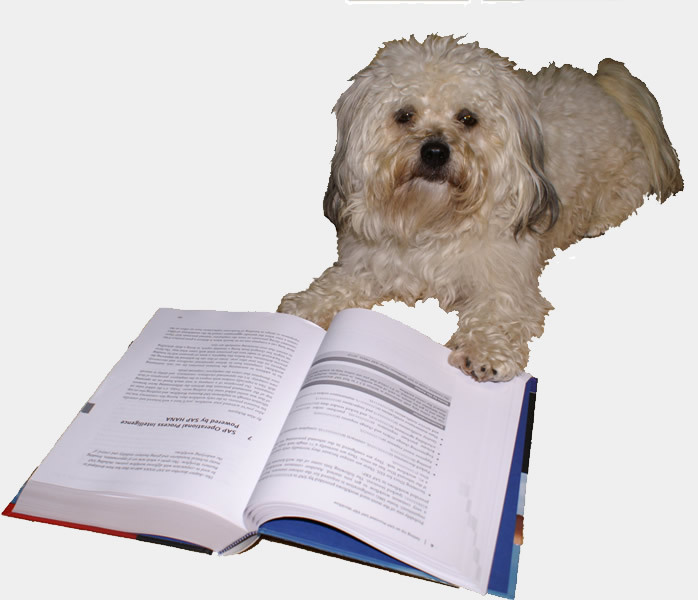 Does the book supplant the training courses? No, a training course with a flesh-and-blood trainer allows you to ask questions directly and is the best way of getting up to speed fast. That is why this workflow book does not include training exercises. Does the book supplant the need for external consultants? For very simple stuff, yes - particularly if you are already using WebFlow and have the logistics already setup. For more extensive work - no. An experienced consultant allows you to learn from OTHER peoples mistakes, without making them yourselves. Workflow consulting is often about merging of business consulting with technical knowledge of the tool. Does the book contain anything I can give to my manager/colleagues/clients to help them understand workflow/webflow? Absolutely. The first couple of chapters especially. Chapter 1 explains what workflow is all about, what scenarios are suitable for workflow, and the benefits workflow brings. Chapter 2 gets into some of the practical business aspects of workflow, such as understanding how will workflows affect your workplace, how to decide which workflow features will give you the best value for money, and how to measure the success of your workflows. Plus there's an ROI checklist in the appendix to get you thinking about how to prove the benefits. We even have a chapter on how to choose the best inbox(es) for work item delivery. What release is the book based on? It's based on SAP Basis 6.10 - the latest and greatest available and in use (EBP/CRM 3.0 are on SAP Basis 6.10) at time of print - however just about everything we talk about or show you exists in 4.6C already, and for lower releases most of it is much the same, although some of the screens look a little different. Does the book contain any examples or checklists? Yes of course. We especially have lots of screen shots. Plus we have examples of code e.g. for writing your own business objects or agent determination rules. The appendix has a bunch of checklists on things like quality assurance for design/implementation, housekeeping checklists, ROI, etc. Is the book relevant to me if I do workflow but not in R/3 ? Hail CRM, EBP, Wf-XML, Archive-link, Outside-in consultant! 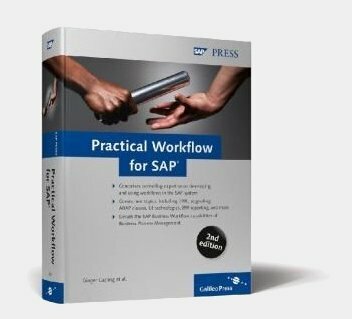 Yes we have some chapters for you too, and anyway workflow works in the same SAP Basis environment whether you are in R/3, CRM, EBP, Wf-XML, outside-in, etc.,etc. so it's all relevant anyway. You can purchase the book from the publishers directly (www.sap-press.com ) or from any reputable online or local bookshop. For more information (including the table of contents and detail about the book) please consult the SAP-PRESS description.